Invisalign before and after: A review of what clear aligners are really like. Sometimes a little knowledge is enough to get you through, sometimes not. My daughter Bibi dove into Invisalign treatment with a fairly thorough understanding of what was about to happen. I was right there with her, “fully schooled” on how the process worked, what the steps would be and how the end result might look. In it together we were, right from the first time she brought up her lower teeth (I wrote about that here). Then came the orthodontist appointments, the X-rays, and finally, the arrival of the aligners themselves. We even watched a step-by-step visual treatment plan showing exactly how her teeth would change. Only, now that we’re in it for real, it turns out the experience is a little different to what we’d expected. In a good way, actually. A really good way. The pre-process, aka A Matter of Trust. Bibs was fitted with her first Invisalign clear aligner, which, if you didn’t know, is like a very thin, clear mouthguard for the upper and lower teeth. You can barely see them, and even then, only if you look hard. We were surprised to learn that her entire aligner program was ready that day. As in, there must have been five boxes of the Invisalign aligners waiting for us. That’s 52 sets. “Yep,” was the reply from the orthodontist. “You come back for check-ups, we make sure everything is as it should be. We can see if you have been wearing them, as well.” (I liked that bit, not that Bibs would fudge wearing them because she’s – you know – an angel child). All good, I thought. Great, actually. And here’s that reality versus expectation thing. I knew from a bit of reading that it would be a good experience, but the reality was actually better. And certainly for Bibi as well, who entered with a bit of trepidation because what healthy, self-respecting teenager doesn’t? See? They&apos;re clear! Image: Supplied. The first few weeks, aka Life with Invisalign clear aligners from the one who’s wearing them. While only a few weeks in, here&apos;s what we&apos;ve noticed so far. You really can&apos;t see them unless you&apos;re having a good look for them. Bibs was rapt to find most of her school friends had literally no idea she was wearing her aligners. That was great for her confidence in the product, and ultimately, herself. Sport, going to the gym and dance especially are no problem at all. Each Invisalign clear aligner set lasts one week. That&apos;s it. So, as the treatment coordinator explained, each week is literally another week through the process. And given we have all of the sets already, we can see progress. It gives Bibs a sense of control, especially at a time in her life where things are about to change so much (she&apos;s in her final year of school). The important stuff – Food. "One of the best things is that my food choices aren’t limited because I can take the aligners out at meal time," she says. "I can still eat Dad’s chilli tomato pasta and not panic about getting the rocket leaves stuck in my braces. It’s not really a big deal in the scheme of things but it’s just a lot easier so that’s cool." A big deal? Not in the scheme of things, but it does make us both pretty happy. (And Dad&apos;s pasta isn’t as good as he thinks it is). Have fun with it, Bibs. Image: Supplied. The really important stuff – real life. 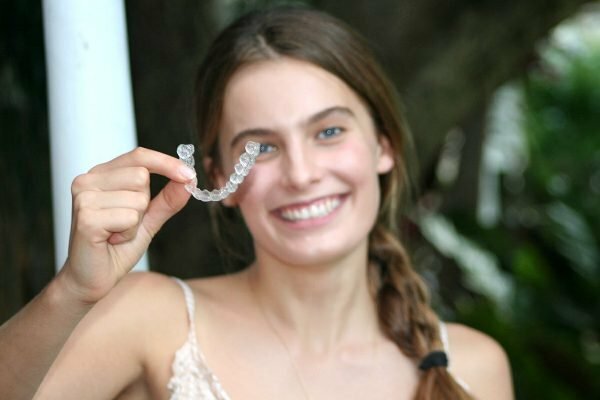 I’m not sure who was more nervous about the other reality of Invisalign clear aligners, but after just the first week it was pretty clear that any effort spent worrying was indeed wasted. "I don’t mind wearing them out, and I mind less that anyone knows I have them," Bibs says. "I know they’re making my teeth straighter and my bite where it should be. And I got to choose to hang on to the little gap between my front teeth – something I’ve always loved." So really, and this sounds kind of weird, it&apos;s situation normal for a young lady who wants nothing more than situation normal. And best of all, her smile and the structure of her bite are getting the most advanced aligning technology in the world. And maybe, just maybe, from a parent&apos;s perspective, there’s a little life lesson about how good things come to those who have a plan and stick to it, you know? HSC, Invisalign treatment – and lots of other stuff, too. Good luck, Bibs. You can do it. 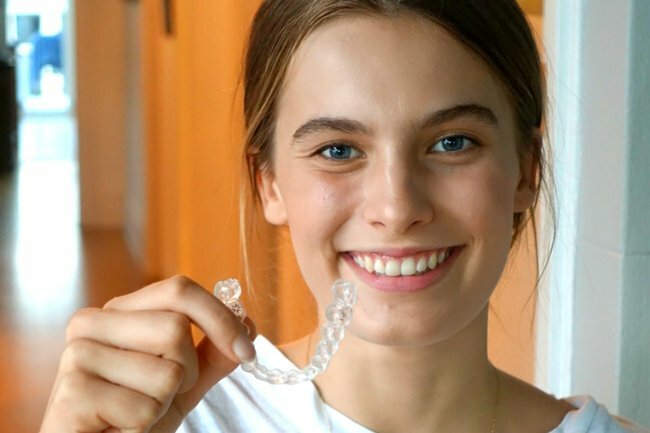 Take a look at the Invisalign free Smile Assessment Tool to see if it could work for you or your teen. Have you or a family member tried Invisalign treatment?